The kidneys lie retroperitoneally along the posterior wall of the abdomen near the junction of the costovertebral angle. 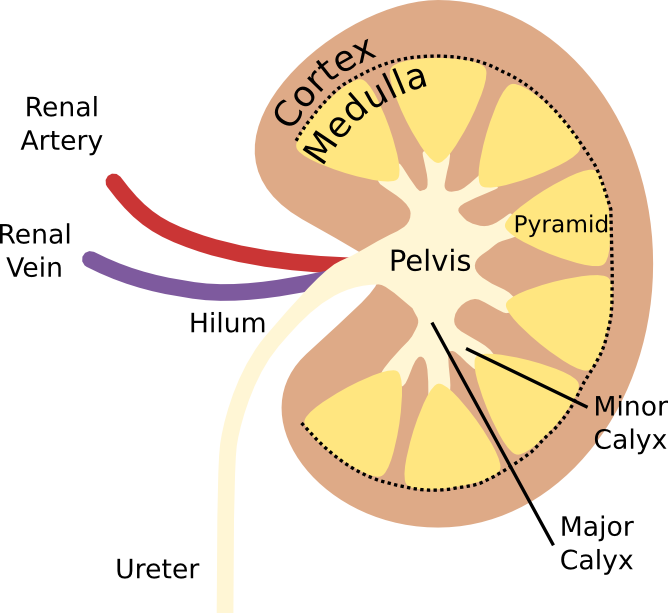 When cut cross-sectionally, the kidneys can be thought of containing two concentric zones: An outer, uniform-appearing cortex and an inner medulla composed of adjacent cone-shaped structures termed renal pyramids. The tips of these pyramids, termed papillae, empty into small funnel-shaped structures, termed minor calyces, that join to form major calyces. All of the major calyces in turn combine to create the central renal pelvis which narrows to create a long thin tube, known as the ureter. The ureter travels down the length of the abdomen to the bladder. The renal artery and vein, together with lymphatic vessels and nerves, enter and exit the kidneys at the organ�s medially located hilum, through which the ureter also exits. As will be seen, blood entering the kidneys via the renal artery is filtered and processed by the organ. Whatever fluid is not resorbed back into venous blood exits the renal papillae, combines in the calyces, and is conducted to the bladder via the ureter. It is ultimately discarded as urine.